The efficiency of prestressed stayed elements when designing very slender steel columns was proved for both stability and strength capacity of the columns. With an increasing number of crossarms placed along the length of the column the effectiveness is further growing in comparison to a stayed column with just one crossarm. First the stability of an “ideal” (perfect) prestressed stayed column with two crossarms is investigated analytically. Similar principal behavior as in the case of prestressed stayed columns with just one crossarm is confirmed and the three zones depending on the value of prestressing are revealed. Expressions for minimal, optimal and maximal prestress are derived analytically. After receiving critical buckling value of the stayed column with the two crossarms without any prestressing by linear buckling analysis (LBA), the maximal critical buckling loading of the column under optimal prestressing is derived. The results are fully demonstrated on a practical example. 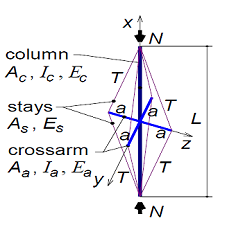 Second the strength capacity of such column but with relevant initial deflections is investigated by the geometrically and materially nonlinear analysis with imperfections (GMNIA) using ANSYS software. Comparisons of critical and strength values under various prestressing are analyzed with respect to a practical design. Finally some recommendations for following studies and practical use are given. R. J. Smith, G. T. McCaffrey, and J. S. Ellis, “Buckling of a single-crossarm stayed column,” Journal of the Structural Division ASCE, pp. 249-268, January 1975. H. H. Hafez, M. C. Temple, and J. S. Ellis, “Pretensioning of single-crossarm stayed columns,” Journal of the Structural Division ASCE, pp. 359-375, February 1979. M. A. Wadee, L. Gardner, and A. I. Osofero, “Design of prestressed stayed columns,” Journal of Constructional Steel Research, vol. 80, pp. 287-298, Janury 2013. K. S. Wong and M. C. Temple, “Stayed columns with initial imperfections,” Journal of the Structural Division ASCE, pp. 1623-1640, 1982. S. L. Chan, G. P. Shu, and Z. T. Lü, “Stability analysis and parametric study of pre-stressed stayed columns,” Engineering Structures, vol. 24, no. 1, pp. 115-124, January 2002. R. R. Araujo, S. A. L. Andrade, P. D. S. Vellasco, J. G. S. Silva, and L. R. O. Lima, “Experimental and numerical assessment of stayed steel columns,” Journal of Constructional Steel Research, vol. 64, no. 9, pp. 1020-1029, September 2008. K. Servitova and J. Machacek, “Analysis of stainless steel stayed columns,” Proc. 6th Intern. Symp. Steel Structures, Korean Society of Steel Construction, Seoul, 2011, pp. 874-881. L. R. O. Lima, P. C. G. Vellasco, and J. G. S. Silva, “Numerical modelling of prestressed stayed stainless steel columns,” Tubular Structures XIV, Taylor and Francis, September 2012, London, pp. 377-382. D. M. Ribeiro, P. C. G. S. Vellasco, R. R. Araujo, L. R. O. Lima, and A. T. Silva, “Numerical assessment of stayed austenitic steel columns,” Proc. of Eurosteel 2017, Copenhagen, September 2017. M. Serra, A. Shahbazian, L. S. Silva, L. Marques, C. Rebelo, and P. C. G. S. Vellasco, “A full scale experimental study of prestressed stayed columns,” Engineering Structures, vol. 100, pp. 490-510, October 2015. R. Pichal and J. Machacek, “Stability of stainless steel prestressed stayed columns,” Proc. 21st International. Conference Engineering Mechanics 2015, Svratka, Czech Republic May 2015, pp. 230-231. R. Pichal and J. Machacek, “3D stability of prestressed stayed columns,” Proc. 22nd Intern. Conf. Engineering Mechanics, May 2016, pp. 462-465. R. Pichal and J. Machacek, “Buckling and post-buckling of prestressed stainless steel stayed columns,” Engineering Structures and Technologies, vol. 9, no. 2, pp. 63-69, June 2017. R. Pichal and J. Machacek, “Single-crossarm stainless steel stayed columns,” Advances in Technology Innovation, vol. 3, no.1, pp. 9-16, 2018. A. A. Vojevodin, “Experience from prestressed mast structures (article in Russian: Opyt iz sooruzenija shprengelnych macht),” Vestnik Svjazi, no. 5, 1956. C. M. Khosla, “Buckling loads of stayed columns using the finite element method,” Electronic Theses and Dissertations, Dept. civil and Env. Eng., University of Windsor, Windsor, ON, 1975. A. K. Jemah and F. W. Williams, “Parametric experiments and stayed columns with slender bipods,” International. Journal of Mechanical Sciences, vol. 32, no. 2, pp. 83-100, 1990. J. P. Martins, A. Shahbazian, L. S. Silva, C. Rebelo, and R. Simoes, “Structural behavior of prestressed stayed columns with single and double cross-arms using normal and high strength steel,” Archives of Civil and Mechanical Engineering, vol. 16, no. 4, pp. 618-633, September 2016. J. Yu and M. A. Wadee, “Optimal prestressing of triple-bay prestressed stayed columns,” Structures, vol. 12, pp. 132-144, November 2017. J. Yu and M. A. Wadee, “Mode interaction in triple-bay prestressed stayed columns,” International Journal of Non-Linear Mechanics, vol. 88, pp. 47-66, January 2017. L. Lapira, M. A. Wadee, and L. Gardner, “Stability of multiple-crossarm prestressed stayed columns with additional stay systems,” Structures, vol. 12, pp. 227-241, November 2017. R. Pichal and J. Machacek, “Buckling and postbuckling behaviour of stainless steel stayed double crossarm prestressed compression elements,” Proc. 24th Internatioal. Conf. Engineering Mechanics 2018, Svratka, May 2018, pp. 681-684. J. Machacek and R. Pichal, “Prestressed Stainless Steel Stayed Columns with Two Crossarms”, AITI, vol. 4, no. 1, pp. 1-10, Jan. 2019.